These garden fencing stakes are suitable for erecting fencing and fruit cages using wire or plastic nets and meshes. This fence stake are spiked at one end for ease of driving. These garden fencing stakes have top clip for fixing mesh or line wires. These fencing stakes are made from a strong angle iron construction. This fence stake is suitable for all light and heavy netting and wire fencing applications including chain link fencing. Pack of six plant support clips for securing most types and sizes of plastic mesh to walls. These plastic mesh clips space mesh from the wall. Includes screws and raw plugs. 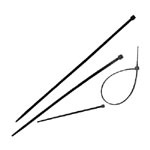 These cable ties are strong, multi purpose nylon cable ties great for fixing garden trellis and garden screening. These felt nails are made from galvanised steel and rustproof with large head ideal for roofing felt. These masonry nails are made from high carbon steel for strength, ideal for most types of masonry. These garden staples are heavy duty galvanised traditional wire staples. These hammer galvanised staples are ideal for fixing netting, garden mesh, garden fence and garden screening. These stem support clips are for securing stems on to walls. These support clips have masonry nail to hammer directly into mortar. These galvanised screw-in vine eyes are suitable for walls and post fixing. Ideal for plant training and wire support lines. These strong hammer in-design will hammer directly into mortar to secure wire supports to walls. These eye bolt type electro galvanised strainers for tensioning wires. These garden weed fabric pegs are in packs of 10, ideal for garden polythene, weed control fabrics, weed stop and frost protection fleeces. These fabric T pegs are black in colour. This spring and ratchet mechanism is for lowering and raising of hanging baskets to allow easy watering and maintenance of flowers. Also can be used for wild bird seed and nut feeders. These heavy duty swivel hooks allow the hanging baskets to be turned for even growth and watering. These swivel hooks are galvanised for durability ideal for baskets and other wall fixings. This hanging basket replacement chain is a standard galvanised 3-way. Fit hanging baskets up to 40cm (16"). This heavy duty hanging basket replacement chain is a standard galvanised 4-way. Fit hanging baskets up to 60cm (24").